PGA Tour golfer Phil Mickelson practices his pitching-wedge shots. The pitching wedge was once the club of choice for a variety of approach shots. When a golfer was beyond sand-wedge distance, but needed more loft than a 9-iron offered, he reached for the pitching wedge. With the advent of gap and lob wedges, the pitching wedge now has greater competition. But as important as the short game is, a pitching wedge remains an important part of most golfers’ arsenals. Loft is the angle of the clubhead relative to the club’s shaft. As the angle increases, the club’s loft increases. Higher-lofted clubs – including the pitching wedge – make it easier to lift the ball high in the air, but all else being equal the ball won’t travel as far as it will when hit with a less-lofted club. When a 9-iron is too much club for an approach shot, it’s time to choose a wedge. The pitching wedge is the least-lofted of the wedge family, so you’ll hit the ball farther than with a gap, lob or sand wedge. Your exact pitching-wedge range depends on your game. Former PGA Tour standout Tom Watson reported in 2008, at age 59, that he hit his pitching wedge 125 yards, so an average male golfer might employ the club for shots of 100 to 110 yards. You can also use it for shorter shots when you must clear an obstruction between the ball and the green, when the ball is against the collar of the green or for other approaches when a chip shot isn’t an option. You’ll generally use a pitching wedge with a good-to-fair lie. Pitching-wedge lofts vary a bit with different club manufacturers. The minimum loft you’re likely to find on a pitching wedge is 43 degrees. Unless you discover an antique from the pre-gap wedge days, you probably won’t find a true pitching wedge with a loft of more than 50 degrees. A typical pitching wedge today features 45 to 48 degrees of loft. Gap wedges literally fill the gap between the pitching wedge and the sand wedge, which usually features a 56-degree loft. Gap wedges typically contain 50 to 54 degrees of loft. Gap wedges are used close to the green, allowing players to take a full swing. Before gap wedges were invented, golfers often employed the pitching wedge for very short approaches where chipping wasn’t possible. 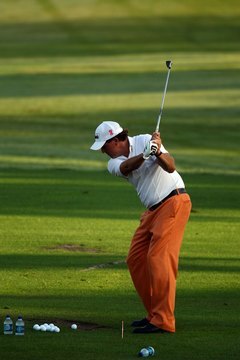 The player would take an abbreviated backswing to avoid hitting the ball too far. Lob wedges feature more loft than a sand wedge, generally 58 to 60 degrees, and are used for short, finesse shots in which the ball must rise immediately and land on the green softly. A few manufacturers even offer lob wedges of up to 64 degrees in loft.